This week I'm over at Judy Nickles' blog on April 27, 2011. I'll be taking my turn with other Class of '85 writers from the Wild Rose Press to talk about my contribution to the series, a story I call "The Girl Most Likely". Have you ever attended a high school reunion, either your own or someone else's? Tell me your story (or just say hello) and you'll be eligible to win a copy of my latest release, "Flawless". Come on by! I'll return to Jana's Journey on May 5 with a new blog. This past Sunday I got together with friends on MSN for a live plotting party. Despite a myriad of problems with MSN and Internet connections, we managed to hash out some issues with a new story I’m putting together. I find it very helpful to have input from trusted writing friends when putting together a plot. They can pick out any glaring plot holes, point out questions of character motivation that I haven’t addressed (or even thought of), or shine a light on any weaknesses they see in the conflict. I find that having others look at the plotting at this stage, before I actually start the writing, saves a ton of time later in revisions. This is the second time I’ve used this method. Back in January of 2010 I assembled the same group for an instant messaging session to discuss my then work-in-progress “Flawless”. Of course at that point, the story didn’t have a name. Actually it didn’t have much of a plot yet either. But with the enthusiastic help of my friends I was able to put together a plot, and eventually the story that became my World War Two romantic suspense set in occupied France came to life. I highly recommend the plotting party. Not only do I find it extremely useful, it’s a lot of fun. There’s nothing I like more than brainstorming with other creative people. 1. Choose your group wisely. Use trusted writing friends you feel in sync with and whose work you admire. You want different points of view but if the ideas and opinions are counter to what you want to write, your plotting session will end in frustration. 2. 2. Do some legwork ahead of time. Sketch out a rough synopsis, lay down the most important elements of the plot, do some preliminary research, if necessary. 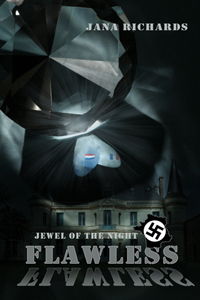 For instance in “Flawless”, because I was writing with the goal of being added to The Wild Rose Press’s Jewels of the Night series, the most important elements were that the story be a romantic suspense that somehow revolves around a blue diamond. I envisioned a story set in World War Two in which a reformed jewel thief is recruited to help the French Resistance steal back a blue diamond from the Nazis. I came up with a very rough plot and a “curse” that was attached to the diamond. Since we were meeting online, and I didn’t want to waste anyone’s time typing out all this information on the day of the party, I emailed whatever information I had ahead of time. Your friends are there to help you smooth out the edges of your plot and add depth. It’s not fair to ask them to write the whole thing for you. 3. The person whose story is being discussed should lead the discussion. Christine Rimmer, whose blog post about her plotting group inspired me to form one of my own, says if the discussion goes in a direction you’re not comfortable with, speak up and lead it back to where you want to go. For instance if one member of the group argues for your story to take on a paranormal bent with vampires and slayers and you’re really not into that, speak up. It’s your story. You must take the lead and the rest of the group must respect that. 4. Save the session! I always save a copy of our instant messaging session to my hard drive so I can refer to it later. There are so many ideas flying back and forth that it’s impossible to write everything down. And I can’t trust my brain to remember everything (or anything, for that matter). Christine Rimmer says that in her plot group, which gets together twice a year in Vegas, they use two tape recorders to record each plotting session, just in case there’s a technical failure. The writer then gets to take her taped sessions home with her at the end of the weekend. I will definitely do this again. We talked on Sunday about how great it would be to be able to get together in person like Christine Rimmer’s group does. I really hope we manage it, but with the four of us living in three different time zones it’s going to be difficult. In the meantime, instant messaging remains an inexpensive if sometimes frustrating alternative. Have you ever participated in a plotting group, either live-and-in-person or through your computer? Would you participate if you had the chance or do you prefer to go it alone? Next week I’ll be out of town on a bit of a retreat, working on the new story I’ve just plotted out. So I’m taking a break from the blog. I’ll see you at the end of the month! I am not good with technology. I never did learn how to program the VCR. Luckily, the PVR we have now is almost idiot proof (almost), but I still get my daughter to operate it if I want to record a TV show. So it’s no wonder that I needed help when my blog went wonky. My right sidebar developed a huge space between the first piece of information, my website address and the rest of the gadgets. The labels and blog archives were located at the bottom of the page where no one was going to see them. Nothing I tried managed to fix it. And then my preview function suddenly quit working! I was ready to pitch this whole stinking blog! I checked the yellow pages in my phone book to see whether I could find someone local to help me out. I found plenty of people who could set up a website for me, create an advertising campaign, or market a business using traditional and social media. After checking out several websites for these businesses, I came to the conclusion that a) they all were way too expensive for me, and b) none of them addressed my specific needs. I wanted someone who would take me by the hand and show me how to fix my blog or go in there and do it herself. And I didn’t want it to cost a lot of money. And then the answer came to me in the mail. The March 2011 edition of RWA’s Romance Writers Report carried an article entitled “Is it Time to Hire a Virtual Assistant?” by Jenel Looney. A virtual assistant can help a writer with dozens of tasks, freeing up the writer’s time to do what she really wants to do—write. A virtual assistant can help with marketing efforts, such as coordinating social networking efforts to make sure the writer is taking full advantage of the promotion these sites offer. A VA can help with updating a website, or can assist with design. She can set up a blog tour for you, which I know from experience can be time consuming. She can also contact review sites to set up book reviews on the writer’s behalf, if her publisher isn’t already doing that. A VA can help brainstorm the types of marketing materials such as bookmarks, sticky notes, pens and other goodies you want to give away as prizes for contests or as gifts at conferences. And speaking of contests, your VA can keep track of entries, draw a random winner and mail the prizes. Following Ms. Looney’s advice, I posted a request on the IVAA website, outlining my problems with my blog. Within 24 or hours (or less) I had a couple of replies. I chose to work with Amy Moore of Amy’s Winning Ways (http://blog.amyswinningways.com) For a reasonable fee, she fixed my blog problems and gave me some advice about some other issues. I hope to work with Amy again sometime in the future. Have you ever had technical problems you couldn’t fix yourself (or am I the only inept one?) Do you ever wish you had an assistant to help you with the many non-writing tasks a writer needs to do? Have you ever hired a virtual assistant or some other kind of outside help? In totally unrelated news, please join me at http://theromancestudio.com/party this weekend, April 8, 9, & 10 for a chance to win a Nook ereader! All you have to do for a chance to win is to comment on my posts or on the posts of any of the authors attending. There are tons of other giveaways as well. I hope you drop by!